The Atacama Large Millimeter/submillimeter Array (ALMA), the most powerful collection of radio telescopes in the world, is built on the Chajnantor plateau in northern Chile. At an altitude of 5,000 meters (16,500 ft), it’s higher than the thickest layers of Earth’s atmosphere. These telescopes allows us to decipher wavelengths that are longer than optical light, revealing light (or colors) that we can’t see with our own eyes. But ALMA, which means “soul,” is also a time machine. It looks into the past to verify scientific theories of how the universe formed over 13 billion years ago. It also propels us into the future as we search for new worlds and for the alien life that inhabits them. In the giant gas cloud Sagittarius B2 near the center of our galaxy, ALMA has detected for the first time in interstellar space a hydrogen-rich, carbon-bearing molecule related to the ones we need for life on Earth. This discovery means that interstellar molecules like these may have come to Earth in the distant past to jump-start life here. It also suggests that carbon-based alien life may exist elsewhere in the universe. 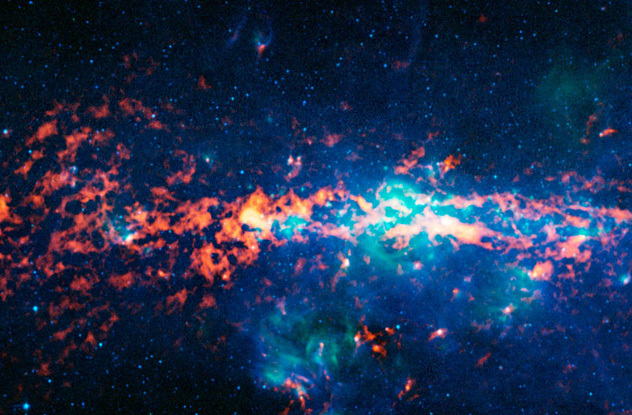 Molecular clouds like Sagittarius B2 are known as “stellar nurseries” because their compact areas of gas and dust are well suited for creating stars. Until now, all organic molecules discovered in interstellar space have consisted of one straight chain of carbon atoms. But in Sagittarius B2, ALMA found a new molecule, iso-propyl cyanide, with a branched carbon structure like that found in amino acids. Amino acids are the building blocks of protein, which are key components of life on Earth. This discovery suggests that the molecules needed for life as we know it are created when stars are forming, well before planets like Earth exist. Iso-propyl cyanide was plentiful in Sagittarius B2, so branched molecules may be common in interstellar space. Astronomers hope to find amino acids there, too. 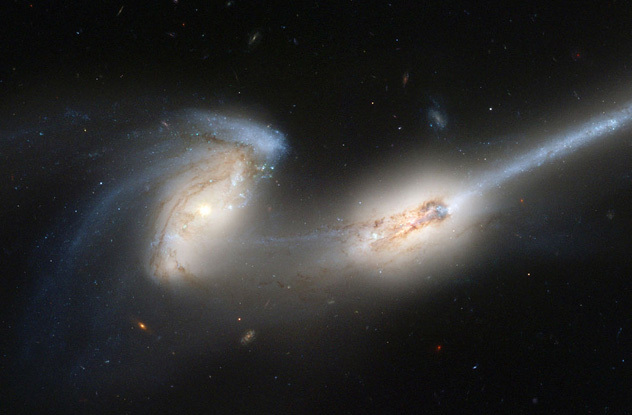 Violent mergers between galaxies are quite common. But their stars and solar systems don’t actually collide. Instead, these galaxies pass through each other like ghosts because their stars are too far apart to touch. A merger does set off a frenzied formation of new stars, along with gravitational chaos. This was long believed to destroy the original galaxy structures, replacing them with one massive elliptical galaxy shaped like an American football. This was supposed to happen even if both of the original galaxies were disk galaxies—like our Milky Way—featuring flattened, circular areas of gas and dust. That’s been the prevailing wisdom since computer simulations were done in the 1970s. Newer simulations contradicted these results, suggesting that some galaxy mergers may form disk galaxies. But scientists had no proof either way. Now, however, ALMA and other radio telescopes have provided the smoking gun with 24 observed galaxies that have undergone mergers to form disk galaxies. That’s 65 percent of the 37 galaxies surveyed by an international research group headed by Junko Ueda of the Japan Society for the Promotion of Science. Some exoplanets, which are planets outside of our solar system, orbit their stars in a highly elongated or oval shape (an “eccentric” orbit) or at a highly tilted angle from their star’s equator (an “inclined” orbit). To find out why this happens in binary systems, in which two stars orbit each other, scientists used ALMA to look at HK Tauri, a young binary system in the Taurus constellation. To understand what ALMA does, it helps to know how stars and planets are made. When a cloud of interstellar gas collapses into itself from the pull of its own gravity, it swirls faster and faster until it flattens into a disk. In the center of that disk, a protostar forms like an embryo in a womb. When the protostar’s core temperature becomes high enough to spark nuclear reactions, a new star is born. 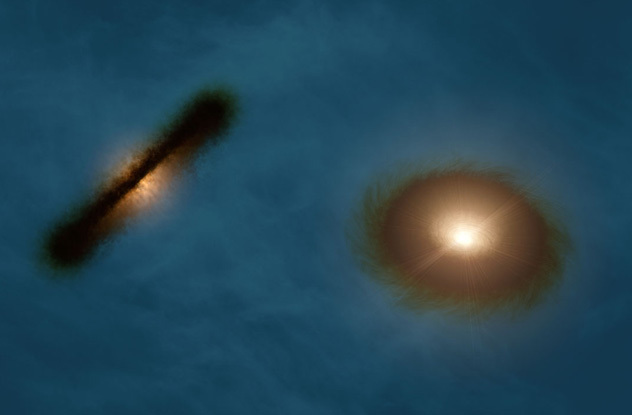 About 90 percent of the time, gas and dust left over from the star’s birth rotates around the new star in a protoplanetary disk. The material in this disk may eventually form into planets, moons, and other objects. 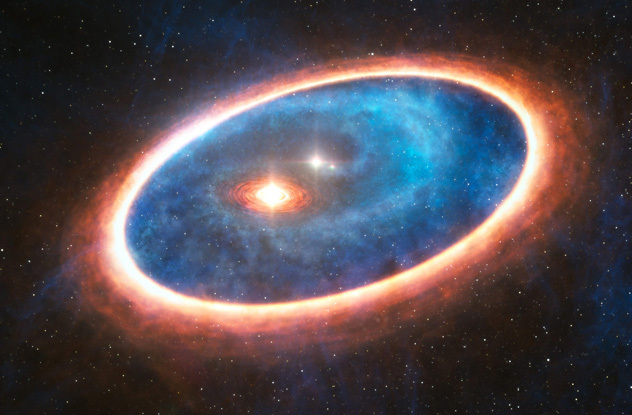 In a binary system, if the two stars and their protoplanetary disks don’t orbit on the same plane (which means they’re “misaligned“), new planets may form with highly eccentric or inclined orbits. One theory, the Kozai mechanism, says the pull of gravity from a second star gives the first star’s planets these weird orbits. ALMA confirmed this theory with HK Tauri. The dimmer star, HK Tauri B, has a protoplanetary disk that blocks the glare of the star’s light, making the disk easy to see in visible light. But the protoplanetary disk of HK Tauri A is tilted so that the blinding light from its star makes this disk impossible to see in visible light. ALMA detected both disks easily in millimeter-wavelength light, revealing that they’re misaligned with each other by at least 60 degrees. At least one disk is not on the same plane as the two stars’ orbits. While this doesn’t explain every weird exoplanet orbit in the universe, it does show that the conditions to skew an exoplanet’s orbit may be present when that planet forms in a binary system. In a multiple-star system known as GG Tau-A in the Taurus constellation, ALMA has detected gas and dust flowing in a stream. The stream flows from an immense outer disk surrounding the whole star system to a smaller inner disk encircling only the main central star. It looks like a wheel within a wheel. Scientists had been aware of that inner disk before ALMA, but they couldn’t explain how the inner disk survived. Its material was being depleted by its central star so quickly that the disk should have vanished long ago. Then ALMA detected this never-before-seen phenomenon: gas clumps in the area between the two disks acting as a lifeline by transferring material from the outer disk to feed the inner disk. The inner disk can therefore survive a lot longer, giving it a greater chance of developing planets that orbit around the central star. If other multiple star systems have these lifeline structures to feed protoplanetary disks, we’ll have more places to hunt for exoplanets—and alien life—in the future. At 5,000 light-years away from Earth, the Boomerang Nebula in the Centaurus constellation wins the prize for the coldest known object in the universe. Its temperature is only 1 Kelvin, which is the same as –272 degrees Celsius (–458 °F). That’s even colder than the cosmic microwave background, which, at 2.8 Kelvin, is the natural background temperature of space. 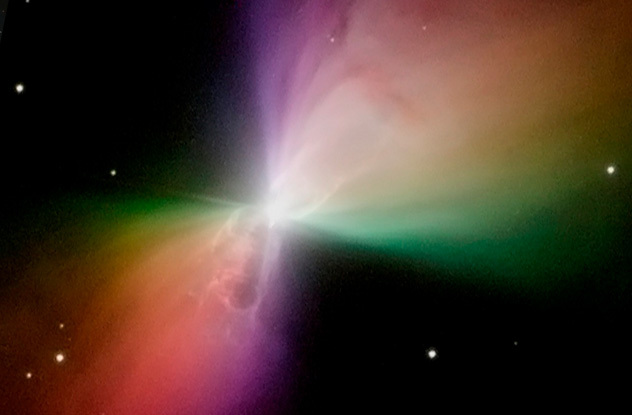 Scientists examined the frigid properties of the Boomerang Nebula using ALMA. In the process, they also discovered the nebula’s actual shape. Previously, optical telescopes depicted the nebula in visible light as a bow tie with two overlapping boomerangs. But ALMA could visualize wavelengths of light that were previously obscured by a thick band of dust encircling the star inside the nebula. 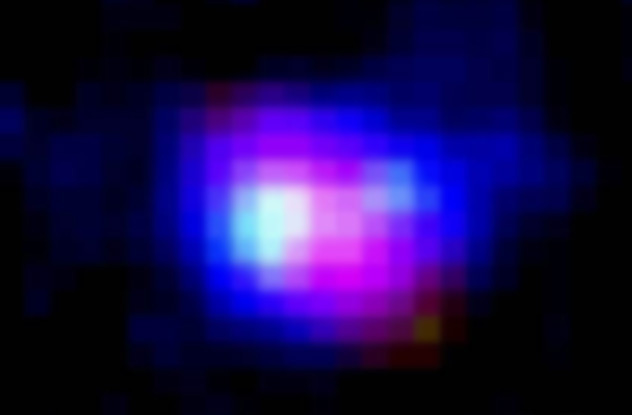 It turned out that the nebula has a much broader shape, which is expanding quickly. Photo credit: M. Ouchi, et al. This finding from ALMA is exciting because of what the telescopes didn’t see. But let’s start with what our telescopes did see. In 2009, astronomers discovered a glowing, hot gas bubble spanning more than 55,000 light-years. They called it “Himiko,” after a legendary queen of Japan. At almost 13 billion light-years from Earth, and given the time it takes for light to travel that distance, scientists were seeing Himiko at a time when the universe was just 6 percent of its current size. It seemed far too big and powerful for its era. But here’s what left astronomers scratching their heads. An area with such active star formation should create dust clouds of heavy elements like carbon, oxygen, and silicon. When heated by starlight, these elements produce radio wavelengths that ALMA can pick up. But ALMA didn’t detect any significant radio waves. Nor did it detect gaseous carbon, which is also associated with furious star formation. Instead, astronomers believe that Himiko’s interstellar gas is made of hydrogen and helium. This probably means we’re seeing a primordial galaxy as it’s forming shortly after the big bang. Without dust, none of us would exist. Dust is critical to the formation of stars and planets. We know the universe is filled with it, but scientists weren’t sure how dust formed in the early universe. Today, most dust in the universe comes from stars of all sizes as they die. But in the early universe, only massive stars had gone supernova. That accounted for some dust but seemingly not nearly enough for the large amounts seen in distant, young galaxies. 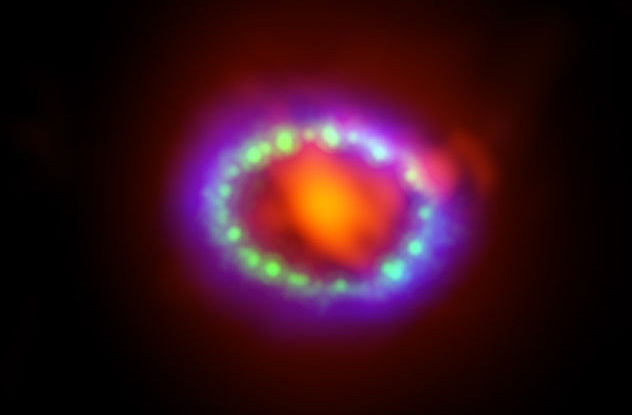 Then astronomers examined the remains of Supernova 1987A with ALMA, and they found the answer to the missing early dust. As the name implies, SN 1987A exploded in 1987 about 168,000 light-years from Earth. Scientists expected to see large amounts of dust as carbon, oxygen, and silicon atoms bonded into molecules in the center of the cooling gas from the explosion. With the telescopes of that time, they saw only a small amount of hot dust. But when they used ALMA, they detected a dust cloud with a mass equal to 25 percent of our sun. With ALMA’s ability to reveal the millimeter and submillimeter wavelengths in which the (much more plentiful) cold dust glows brightly, the mystery was solved. 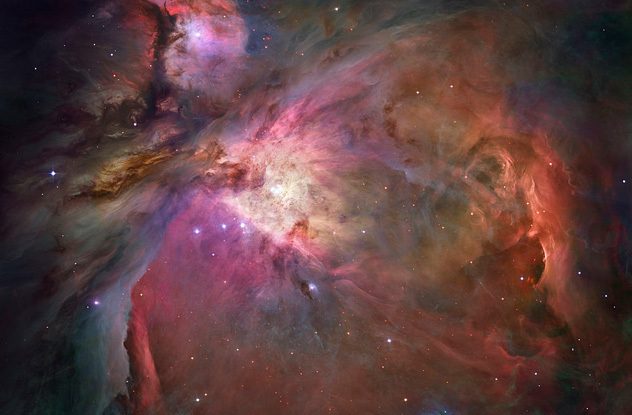 There are planet-killers lurking in the crowded stellar nursery of the Orion Nebula. As we explained earlier, large molecular clouds of gas and dust like the nebula provide an excellent environment for creating stars and eventually planets. But there are also older O-type stars in the Orion Nebula that are far more massive than our sun and have surface temperatures of 50,000 Kelvin or more. These O-stars wield the power of life and death over developing planetary systems in their region. When these massive, short-lived O-stars go supernova, scientists believe the resulting explosions create clouds of gas and dust that will form the next round of stars and planets. But while these O-stars live, they can destroy protoplanetary disks if those embryonic solar systems get too close. With ALMA’s ability to see objects hidden by dust, astronomers are able to visualize twice the number of known protoplanetary disks in the Orion Nebula. The data shows that if young stars get within one-tenth of a light-year of an O-star, the intense ultraviolet radiation will strip away the young star’s protoplanetary disk before planets can form. This extreme electromagnetic radiation often pushes the affected young stars into the shape of teardrops. The event horizon is a theoretical boundary surrounding a black hole that represents the point of no return, where nothing—not even light—can escape the hole’s gravitational pull. Scientists want to use the EHT to see if an event horizon actually exists at the supermassive black hole at the center of our Milky Way galaxy. It’s believed that this black hole, Sagittarius A*, packs the mass of approximately four million suns into an incredibly small area. 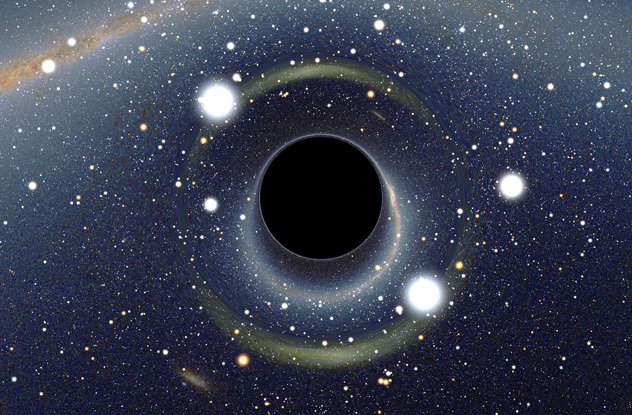 To further test Einstein’s general theory of relativity, the EHT will also scan Sagittarius A* for a shadow, which is a darkened area where the black hole has swallowed light. With the shape and size of its shadow determined by Sagittarius A*’s spin and mass, the EHT’s data could reveal how space and time warp in this environment. Astronomers also want to observe the collision of Sagittarius A* with G2, a huge cloud of gas and dust, to see how that affects the black hole and our galaxy. This collision will last more than a year. In early November 2014, ALMA gave us the first detailed view of planets forming in a protoplanetary disk around a young Sun-like star. The star was HL Tau, in the Taurus constellation about 450 light-years from Earth. This astoundingly clear image shows the birth of a new solar system and also provides a window to our past by revealing how our own solar system may have formed more than four billion years ago. In visible light, HL Tau is hidden behind a giant cloud of gas and dust. But, once again, ALMA was able to scan at much longer wavelengths to see through the dust to the cloud’s core, where the planet-making activity was taking place. ALMA’s new image confirmed quite a bit of scientific theory about planet formation. ALMA also gave astronomers at least one big surprise. HL Tau was supposed to be too young for large planetary bodies to circle around it. 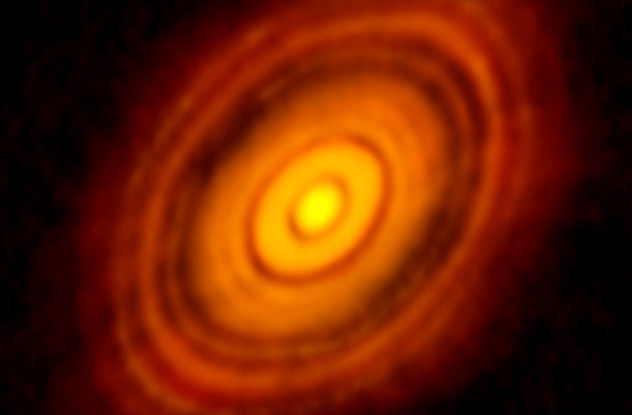 But ALMA clearly shows concentric rings cutting through HL Tau’s protoplanetary disk. When planets increase in size, they create these concentric rings, separated by gaps where the planets are orbiting their young star and pushing debris out of the disk.